In this project we used bamboo as a support for the orchids. The bamboo lattice had already been constructed before we began this project so we have no photos on creating it, but it’s very simple. 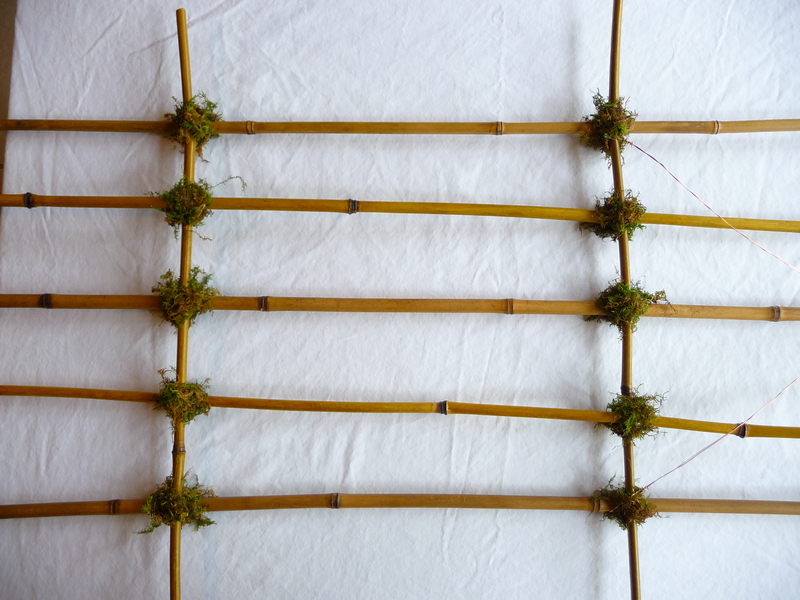 All you need is some aluminum wire to wrap around the bamboo wherever it intersects on your grid. Then use industrial strength glue (we use E600) to reinforce the intersections and then add some sheet moss before the glue dries. We may build another one and show how it’s done, but like I said, it’s very simple. 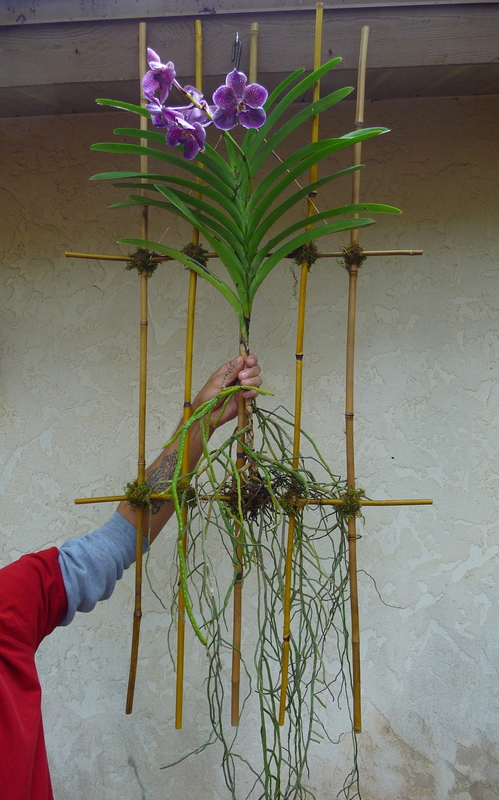 The orchids we used for this project are Vandas because of their long dramatic roots. They normally come in a small plastic basket with the root growing out every possible hole. First thing you want to do is to very cautiously cut the basket away from the roots. We used wire cutters and took our time to avoid cutting the roots by mistake. 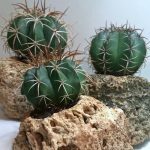 If you accidentally chop a root, it’s not the end of the world, the plant should be okay. Go slow, be patient (hence the quote at the top), and keep going til the basket is gone and most likely in many pieces. Pull some of the roots through the lattice to the other side so the main stem is resting on a horizontal piece of your bamboo grid. Gently wrap some sheet moss around the base of the plant. 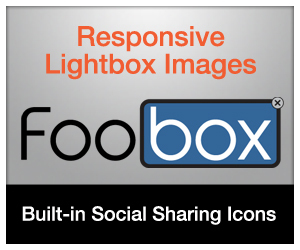 Use more or less depending on the desired look. Moss is generally used for aesthetic purposes but it will help in retaining moisture. 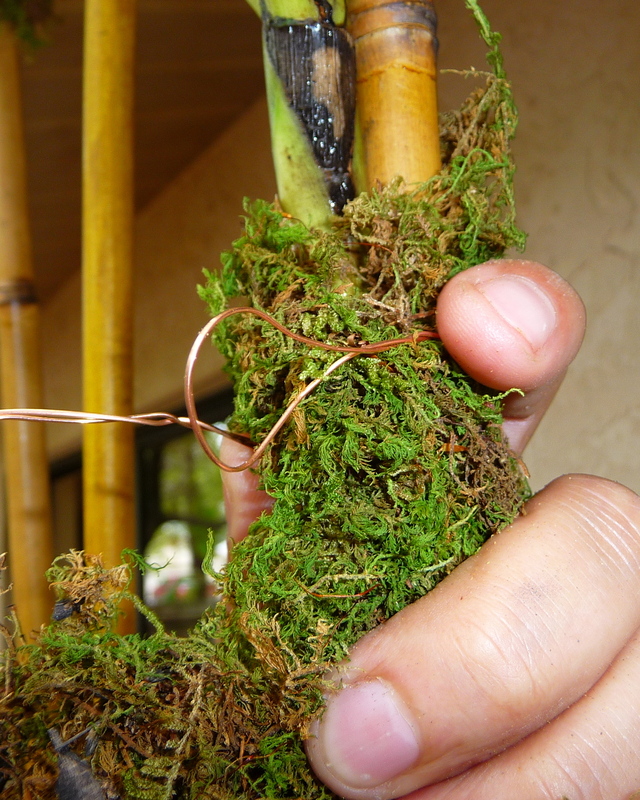 Wrap the sheet moss and orchid to the bamboo with wire but not too tight, you don’t want to crush the roots underneath. 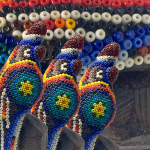 Think of tying your shoelaces….. you want you shoe to be snug but not cut off your circulation! Here you have the finished project unless you want to add more than one orchid which is what we did. We added 3 more by following all the steps per orchid. It’s a matter of preference on how many you want to add. Be creative and use your imagination. Remember, it’s a plant, not a nuclear device, so don’t worry too much about mistakes and have fun! 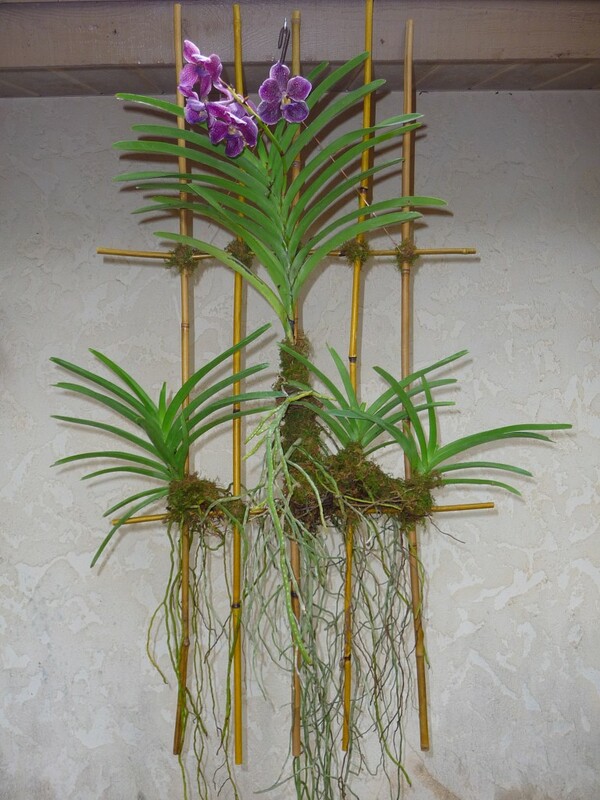 See what it looks like 1 1/2 years later in, Orchids on Bamboo Lattice Revisited! Beautiful, structured design — lush as a jungle. Do orchids in the wild ordinarily attach to bamboo trees or are bamboo stems too hard and smooth for them to attach? Orchids like “spongey material” to grow on as it holds moisture. 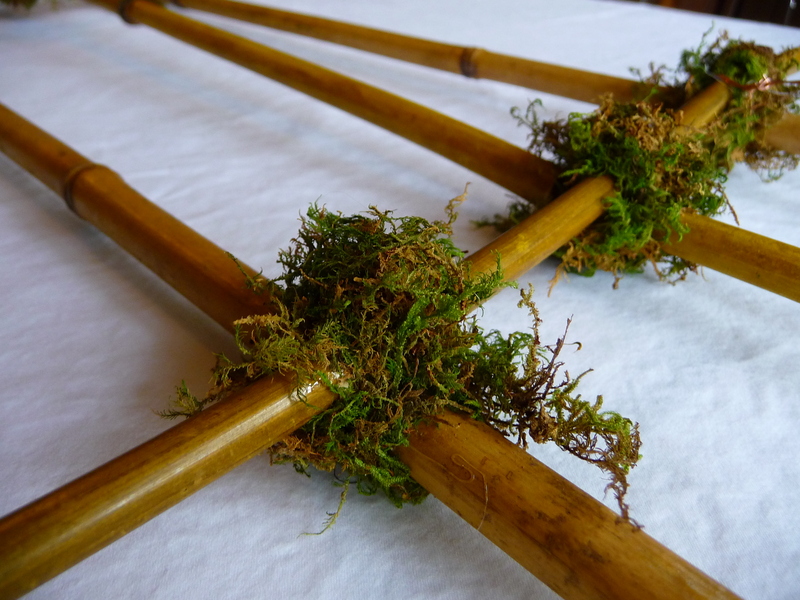 Bamboo is hard material, that’s why they added the sphagnum moss. 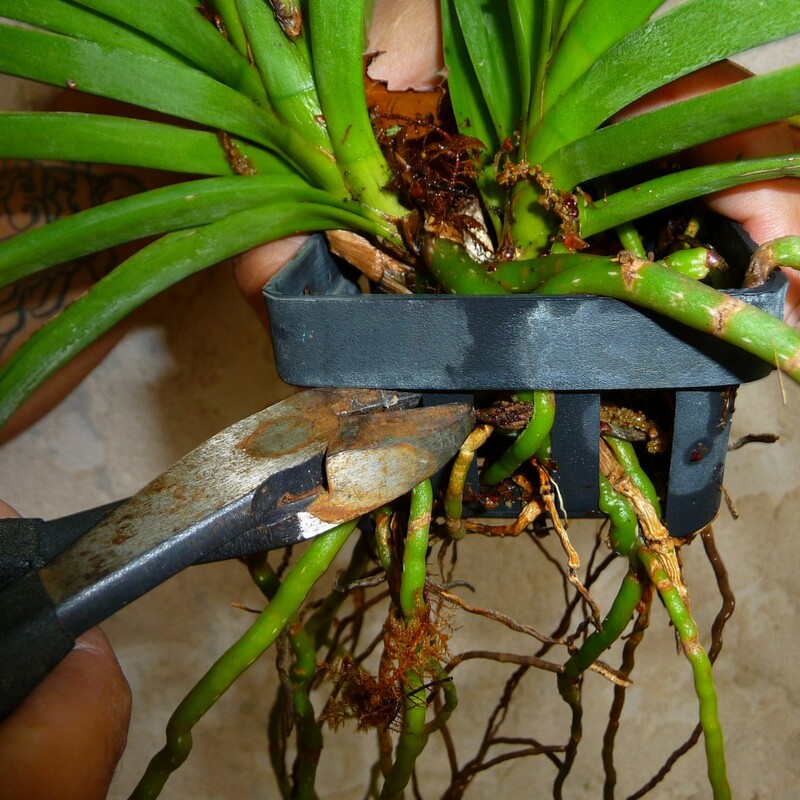 It’s like most orchids want to attach themselves & are content, but Vanda orchids are different. Though they attach themselves, they still like their roots dangling. 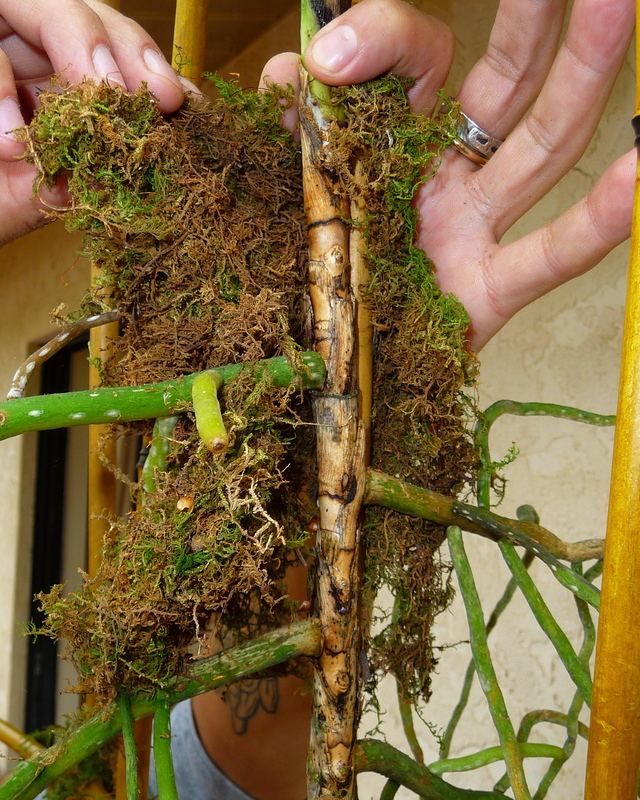 Their roots are usually 2-3 times the length of the plant itself. I currently have 2 Vandas from this year, red & blue. How do you water this? We just spray it with the hose and sometimes we hang it in the shower. depends on what type of orchid you have, is a cattleya, vanda, oncidium, phalanopsis, or cymbidium cattleyas and oncidiums like to be watered once a week they like to dry out , the other orchids like to be watered a bit more frequent,… if you know what type of orchid you have let me know and i will be more specific on the care for that type. Hi you’re welcome! Yes, we secured it with wire after wrapping some moss around the plant. Simple really, nothing fancy. How do you water the vandals on this lattice?